Virginia Lieutenant Gov. Ralph Northam and state House of Delegates candidate Chris Hurst on Wednesday headlined a Pride Fund to End Gun Violence reception that took place in Northwest D.C.
Lori Haas, whose daughter Emily survived the 2007 Virginia Tech massacre, introduced Northam at the reception that took place at Local 16 in Dupont Circle. Northam, who is running against former Republican National Committee Chair Ed Gillespie in the race to succeed Gov. Terry McAuliffe, highlighted his support of LGBT-specific issues that includes adding sexual orientation and gender identity to the commonwealth’s nondiscrimination law. Northam also highlighted his support for gun control, noting he was among the doctors at Landstuhl Regional Medical Center in Germany who treated wounded soldiers during Operation Desert Storm. “Virginians and Americans are standing up everywhere and saying this is not the new United States of America, this is not the commonwealth of Virginia that I’m going to accept as normal, so we’re going to stand up and do something about it,” said Northam. Hurst is a former reporter for WDBJ, a Roanoke television station, who is running against state Del. Joseph Yost (R-Giles County) in the 12th House District that includes Virginia Tech. A former colleague shot Hurst’s girlfriend, WDBJ reporter Alison Parker and her cameraman, Adam Ward, to death on Aug. 26, 2015, as they were interviewing Smith Mountain Lake Regional Chamber of Commerce Executive Director Vicki Gardner during a live broadcast. Parker’s parents are among those who attended Wednesday’s reception. 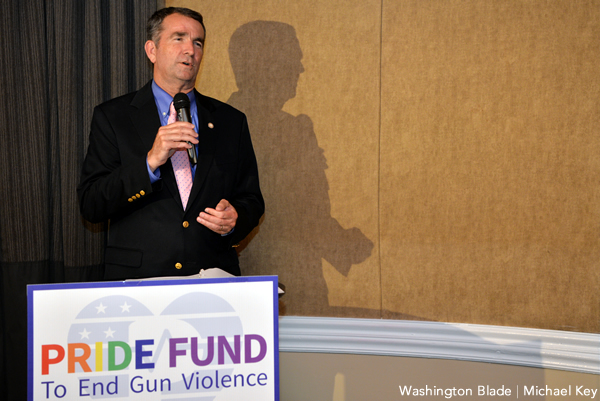 The Pride Fund to End Gun Violence is a political action committee that formed in the weeks after a gunman killed 49 people and injured 53 others inside the Pulse nightclub in Orlando, Fla., on June 12, 2016. Wednesday’s reception took place less than a month after a gunman shot Louisiana Congressman Steve Scalise and three others who were practicing for the congressional baseball game at an Alexandria park. June 12 marked a year since the Pulse nightclub massacre, which is the deadliest mass shooting in modern U.S. history. Brandon Wolf, a member of the Pride Fund to End Violence’s board of directors who survived the Pulse nightclub massacre, noted 33,000 Americans will die from gun violence this year. He also sharply criticized lawmakers who he feels have not done enough to address the problem. Define for me what makes one gun (like the AR-15) so harmful that it should be banned while leaving higher caliber AND higher muzzle velocity hunting or ranch rifle firearms legal? And since, statistically, handguns are far more often used in mass shootings (the events he is pandering to in bringing up “assault weapons”), when are those going to be targeted? A gun only has a trigger that releases the hammer to hit the primer which ignites the powder, which propels the projectile down the barrel, and when the projectile leaves the barrel the function of the gun is ended. Everything before and after does not involve the gun. OK, let’s just say all guns firearms cannonballs gunpowder just magically disappeared today. Would there be calm peace niceness everywhere? Or would gangs and thugs take over? Why, tomorrow the demand would be so great it would break all the banks what with militaries govts citizens desiring to buy self protection. Cottage industries spring up. Make guns in every garage. Guns equalize young vs old, strong vs weak, protection of families. For all intents and purposes Great Britain banned firearms for civilian use many years ago. The crime rate has not gone down, their murder rate has not gone down and now Britain is looking to ban knives. Any knife over 10 inches long is it illegal to have in public and they want to make them even smaller. What these people want to do is ban guns but they don’t have the balls to say so.